I started my day as everyone else. Killing wolves and disprove the kobolds who claim I won't take their candle. Luckily Brother Paxton in the library gave me a compass to find my objective fast. I want to become strong and rich, and walking in circles won't make it happen. To cooperate, you don't need friendship, trust or a common flag. All you need is common interest. I met a mage. I don't know him. I don't know anything about him except that he was also charged to kill kobolds. I invited him to form a group. We killed all the kobold vermin, workers and laborers together. The quests were completed in half time. Time is money friend. I was sent to collect 12 red burlap from Defias. I turned it down. I'm unsure if those defias all carry burlaps, I don't want to spend the whole day killing them and finding only cheese and trash. I lost some XP and loot by this choice. But I kept my time. Fair trade. The best investment is your brain. You can lose everything else, if you have brain, you will be in buisiness again no time. So I did not bother to spend all my coppers at the paladin trainer. Those coppers are well spent. I was lvl5 when I entered Stormwind. I did not want to spend my time on lowly payed servant jobs more than I had to. I had things to do here and I want to have them done. At first I had to make my first trip to the Auction House, the field of getting rich. I will write more about it later. Secondly I took my professions. Herbalism and Mining. They provide sellable goods needing no other ingredients than my workforce. While I want to show that becoming rich does not need endless farming, everyone must start somewhere. And since every investment needs money to invest, there is no other start than work. So herbs and mines beware! I met a man who shouted "Free gold for lowbies". Among the alliance, such charity is considered noble. Most goblins would definately call him mad. I talked about this with Gazlowe once, back in Ratchet, who disagreed. I will tell you his opinion about charity. Anyway, I did not took his money. I want to prove you that one can be rich without help, only by his own work. After all these I hit the Deeprun Tram to Ironforge. I will see what job opportunities do the dwarfs offer. I will take the faster quests from both cities to become stronger fast. In an hour two more levels and several stacks of herbs were collected in the snowy land of the dwarfs. After the work, I returned Ironforge and put the herbs to the Auction House. I underpriced them a bit, because I wanted them to sell. As the goblin saying says: You can sell fast or sell high, but can't sell high fast. I need some money for start and I can't afford to wait for days for some extra profit. I also spent some silvers on a 6 slot bag. Cheap and small but better than throwing away stuff that could be sold. Welcome as a provider to the Blogosphere! Thank's for linking to my blog. For some reason it doesn't work linking to my blog address if you do it in Blogger. It just shows old postings. Use my feedburner address instead. And it will work perfectly. The point of this blog is indeed to help all readers to have enough gold. 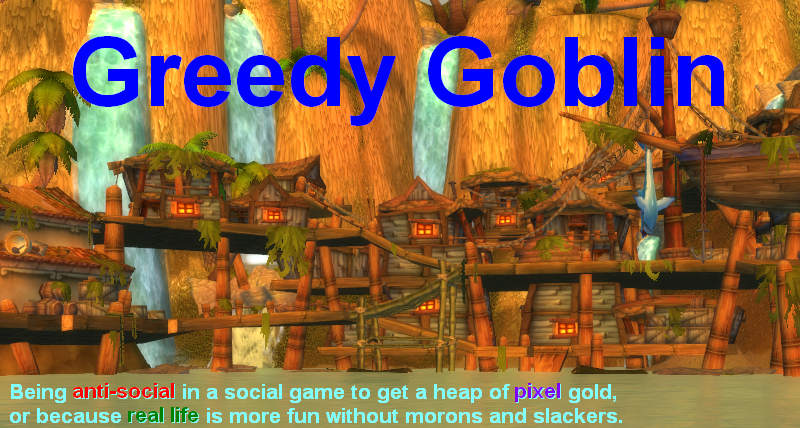 I hope the goblin thinking helps to fill the gold coffers of your lovely inn.